Encompassing a lifelong passion for comfortable interiors, each of the accent chairs and ottomans in this collection is genuinely designed to create a one of a kind aura meant to reflect the tastes of individual homeowners. 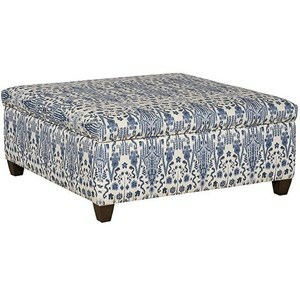 This particular accent ottoman is a piece of sophistication that is both rustic and elegant. While a traditional rectangular box cushion shape creates a plush and comfortable footrest seat cushion, exposed wood feet and nail head trim add a hint of detail that is charming and elegant. 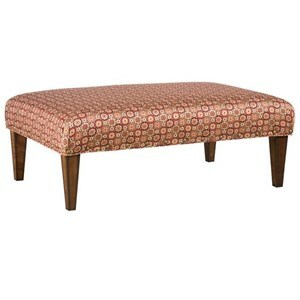 Coordinating well in traditional home settings, this ottoman is also available with its coordinating accent chair. The King Hickory Accent Chairs and Ottomans Athens Traditional Accent Ottoman by King Hickory at Godby Home Furnishings in the Noblesville, Carmel, Avon, Indianapolis, Indiana area. Product availability may vary. Contact us for the most current availability on this product. When we come home we want to feel as though we are walking into a comfortable euphoria that represents our individual taste and the ownership of our lifestyle. The perfect interior is made up of a combination of pieces that inspire and intrigue us, representing who we are until our room settings meld into us and become a part of our very own life story. The accent chair and ottoman collection by King Hickory takes our greatest desires, our lifetime goals, our need for comfort and our individual tastes and places them into a collection that is traditional yet modern and rustic yet elegant. Encompassing a lifelong passion for comfortable interiors that can be designed and selected to represent individual home desires, this accent collection allows homeowners to take ownership of their accent furniture, making each item in their home truly, 100 percent their own. The King Hickory Accent Chairs and Ottomans collection is a great option if you are looking for furniture in the Noblesville, Carmel, Avon, Indianapolis, Indiana area. Browse other items in the King Hickory Accent Chairs and Ottomans collection from Godby Home Furnishings in the Noblesville, Carmel, Avon, Indianapolis, Indiana area.